On 12 December 2018, the Shire of Augusta Margaret River (“the Shire”) resolved to chop the bolts at Wallcliffe and to ban public access. Therefore, the Shire currently maintains that climbing at Wallcliffe is banned. The Shire Rangers are authorised to issue infringement notices and to confiscate climbing equipment in the event that climbers are found climbing at the crag. The result of this decision is that we have in WA regrettably lost an iconic and irreplaceable crag in circumstances where the amount of climbing in WA is already limited. This is a wakeup call to the WA climbing community. A full transcript of the deputation made on behalf of CAWA is below. Leaving chalk on the cliff. Pruning of trees at the waters edge. Playing of loud music in caves. Damage to cliffs from bolting. Climbing outdoors is not a right but essentially a privilege that can be lost at any moment at any crag. There are currently situations where crags are at risk of being lost in Australia and overseas. They are having some serious issues in the Grampians. According to the Access Fund US, 1 in 5 climbing areas in the US is threatened. It is up to every climber take all reasonable steps to ensure that their conduct outdoors is such that the risk of losing a crag, especially when the number of climbers heading outdoors is steadily increasing with the popularity of climbing set to skyrocket in the next few years. CAWA has established an Access Subcommittee to tackle future access issues in WA. If you have any questions about access you can e-mail CAWA directly access@climberswa.asn.au or cawa@climberswa.asn.au or e-mail any of the CAWA Committee Members or message via the CAWA Facebook Page. CAWA acknowledges the traditional owners of the Land (the Wardandi people) and would like to pay respects to the Elders past and present. Climbing has taken place at Wallcliffe for nigh 30 years, most routes being set in the early 90s. There is no urgency, as they don’t affect the Council’s plans for a public viewing platform. Wallcliffe is a key location for climbing in WA. There is only one other area of similar character of limestone climbing, where climbing is permitted by management plan. Chopping the bolts will forever close an iconic chapter of climbing history in WA. The bolts are required to climb safely at Wallcliffe, as they are needed to protect the climber from falls. The small heads of the climbing bolts that protrude from the cliff, would not be visible from the platform proposed. They are visible only on close inspection. The Golder geological study and the Goode cultural study did not recommend removal. There is no report that recommends the removal or which finds that removal conflicts Shire’s plans. Pruning of trees at the waters edge. Not climbing related. Defecation in caves. Not climbing related. Playing of loud music in caves. Not climbing related. Graffiti and vandalism. It is not part of the culture of climbing. There are graffiti artists that pride themselves on putting graffiti in high places. The only evidence of people entering the caves are permit holders. Not climbers. Intentional damage to vegetation. Some silly do-gooder trimmed the existing access path. Not climbing related. All of the above are addressed in the draft management plan CAWA has provided to Council and the traditional owners. No response has been received from the Council to date. The traditional owners have indicated that they are considering the draft management plan. The investigations of Council to date are inconclusive as to the person(s) responsible for environmental damage at Walcliffe, noting the Cape to Cape Track runs adjacent and the area is reasonably popular with tourists. In WA no other open access climbing area has a problem with bolts (e.g. Churchmans Brook, Kalbarri, Willyabrup, Albany, West Cape Howe, Bluff Knoll and Porongurup). At Albany, Porongrup and Bluff Know there is a viewing platforms. So why chop the bolts? The bolts cannot be removed, as that would cause more damage to the cliff. The small protruding head of the bolts must be carefully ground off, some damage to the cliff is likely. Delaying a decision to chop the bolts will permit a period of consultation and not prevent the Shire from proceeding with its proposed plans. A ban on access would be invalid being inconsistent with the Management Order to manage the Crown Land for the purposes of “Recreation”. 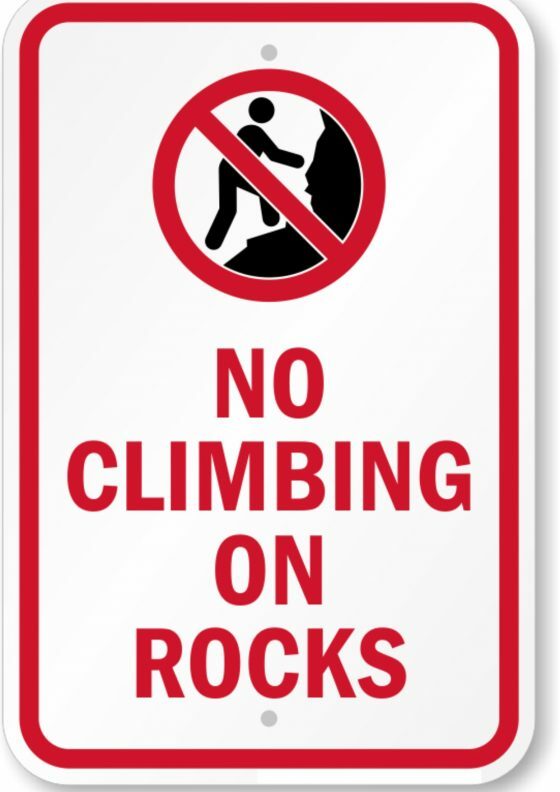 A ban on access will prevent recreation including climbing. Shire’s attorneys have not addressed this issue. Nor have the Shire’s attorneys properly addressed the legal issues raised by CAWA regarding the validity of the 2013 Determination concerning climbing or the related Determination proposed to be made today. The Council should defer any decision on the proposed Determination pending the resolution of these serious legal issues. Further, a ban on access is not supported by expert or anecdotal evidence. All previous reports have recommended restricted access. With respect, Shire has not properly considered other options involving restricted access such as a management plan, codes of conduct, permits, licenses, booking systems or further education or signage. Council proposes to move from completely free public access to a complete ban without proper consideration of options in between. The Standing Committee overturned similar local laws in the 1990s and recommended that the Shire consult with CAWA and consider a management plan. That recommendation has not been followed and history is repeating itself. A number of petitions protesting against the chopping of the bolts and banning access have been signed by over 300 people and presented. A ban on public access whilst permitting access by commercial enterprises sends the wrong message. Allowing commercial interests to profit from visiting Walcliffe is also inconsistent with the Shire’s apparent desire to rigidly protect the cultural significance of Walcliffe. Ironically one of the current permit holders facilitates 3,000 people per annum visiting the site. Climbers would probably number no more than 200 per annum. CAWA urges the Council to defer making the proposed Determination today, until outstanding legal issues have been resolved, and proper consultation has occurred regarding public recreational (including climbing) access in accordance with the purposes of the Reserve. CAWA is willing to work collaboratively with the Shire and the traditional owners to find an acceptable compromise. Thank you madam President for the opportunity to speak here today. I am now open to any questions.